Investors are starting to take on riskier positions just before a 2019 growth slowdown. Mental note. With markets back in rally mode, investors are swinging for home-runs. To be sure, it could come back to bite them in the rear if the broader market turns south this summer amid heightened trade tensions. Riskier stocks will likely be the first ones sold in a pullback. 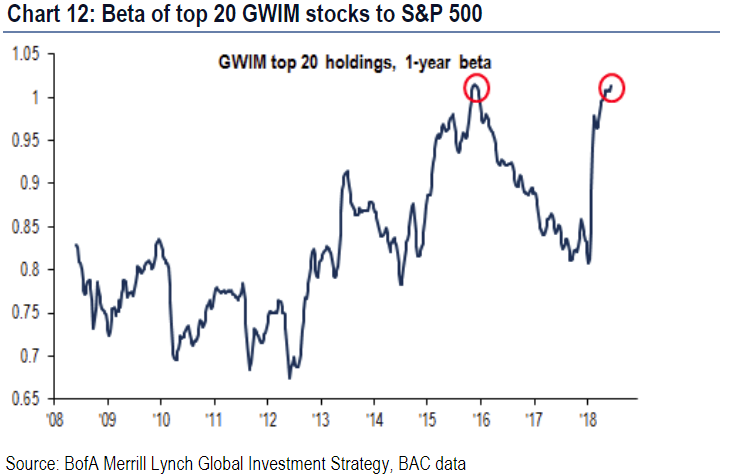 The beta of Bank of America's global wealth investment managers' top 20 equity holdings are at a record high of 1.10 (chart below), points out BofA strategist Michael Hartnett. Investors have increasingly piled into financials, energy and tech stocks, according to BofA data. A stock's beta is a measure of how risky an investment it is relative to the broader market. Stocks with betas over 1.00 are often seen as riskier than the market, with the converse being true for betas under 1.00. Judging by the strong second quarter from Action Alerts PLUS holding JPMorgan Chase (JPM - Get Report) today, investors may not be wrong on chasing bank stocks into earnings season. Meanwhile, it's hard to believe hot tech stocks such as Action Alerts PLUS holdings Apple (AAPL - Get Report) and Microsoft (MSFT - Get Report) won't share big quarters in coming weeks. "All right, so Apple's down a little bit. Look, I could say the same thing about Microsoft, right? Microsoft which I believe because of its red hot Azure business will perform amazingly this quarter, but don't forget the PC business is very good," Cramer said on his latest monthly call with Action Alerts PLUS club members. Want to dabble in riskier trades? Check out TheStreet's sister publication Real Money Pro.